Meet the Winner of the Counseling Office Makeover, Chris Hardiman! 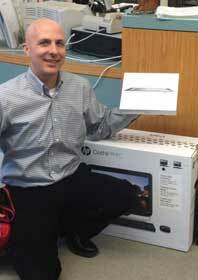 Congratulations to Christopher Hardiman, winner of the CollegeXpress Counseling Office Makeover! Chris won a computer, a printer, an iPad, and some awesome books and products from Wintergreen Orchard House for his counseling library. Thanks to everyone who entered! Chris is a school counselor at Lincoln-Sudbury Regional High School in Sudbury, Massachusetts. He attended Holy Cross College, where he earned a B.A. in sociology and an M.A. in counseling psychology. Chris is a member of NACAC and the American School Counseling Association. Tell us about your big win! I haven't won many contests in my life, so I had a hard time believing it at first! Which of the items have you gotten/will you get the most use out of? How has your big win helped you in your daily work? It is going to allow me to streamline some of my work and allow me to be even more effective with my time. Having access to more technology, especially in the form of an iPad, increases my ability to provide current and useful information to students regarding college and career choices. I feel that, with the addition of these products, I will now be able to maximize my communication and connection with students and manage my time more efficiently. Which Wintergreen Orchard House title is your favorite and why? The College Finder--it's user-friendly and has great, easy-to-locate information about colleges. What's your favorite iPad app to pass the time with (when you're not busy browsing CollegeXpress!)? Still discovering . . .
What inspired you to become a college counselor? I started working with high school students, took a break from that age group and worked in a middle school for nine years, and recently made the jump back to high school. I love being able to have reflective conversations with students about who they are, where they've been, and where they're going in life! The daily interface I have with many different students of various backgrounds. What are some of the common challenges your students (and their parents) are currently facing in the college admission process? We are a competitive suburban public high school with a lot of high-achieving students. The biggest challenge for students and parents is the increase of stress and competition with getting into their desired colleges. What are some of the steps you take to help them successfully overcome those challenges? We hold counseling sessions to remind them that there isn't just one school for them and that the path to success and happiness isn't a narrow, defined one . . . and that this should be their decision, not their parents'! What are your top goals for the students you work with? To help them discover what their passions are, where their academic and extracurricular talents lie, and how they can contribute and give back to society. Have you seen any noticeable changes in college applicants in the recent economic climate? More applicants are applying to more schools, and more applicants are applying to state schools. Have you seen any shifting trends in the majors students intend to pursue? What is the one piece of advice you would give to college counselors who are new to the profession? Get to know your students, and rely on the support and advice of your colleagues! Do you ever encounter situations in which students and their parents have different goals in mind? If so, what is your advice for helping them work together? Yes. Try to have parents take a step back and let their 18 year old have some freedom and independence in the process. If the parents plan to pay for the education, remind the student that they need to include the parents in the process--not to ultimately choose the school the student attends, but to keep in mind some realistic guidelines based on the family financial situation. What can/should a college counselor do to help students prepare for the SAT or ACT? Offer practice tests, explain the difference between the SAT/ACT, and encourage students to take both since they are different kinds of tests. Describe what are, in your opinion, a few of the cornerstones of a successful college admission essay? Be yourself, be yourself, be yourself. Don't try to make yourself out to be someone you're not. What are, in your opinion, some of the best ways that students can make themselves stand out beyond their applications? Show genuine interest in the school, ask questions, and be creative and original. What would you consider your biggest accomplishment or your proudest moment as a college counselor? Getting through the first year of college advising successfully! Favorite college memory: Road trips with friends, and excellent classes and professors. Your personal motto: Be true to yourself and give back to others.